I’d gone down to the waterfront to take some photograph today and discovered the MPI Resolution was docked on the Mersey at the cruise liner terminal. If a ship could ever be described as an impressive piece of kit this one has to be in the running to get that description. The six towers are six jacking legs that allow it to raise the whole hull of the ship out of the water! The large crane in the middle of the picture isn’t on the waterfront but also on the ship. There is plenty of juicy technical information in the brochure on the owner’s website. 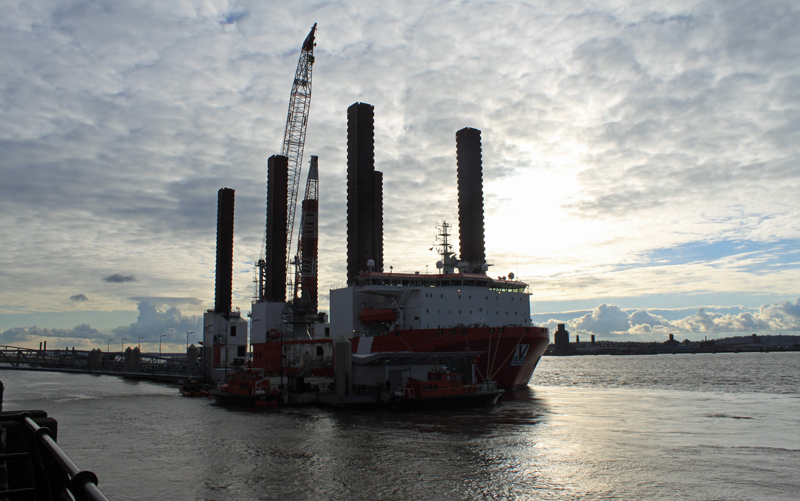 The MPI Resolution is currently operating out of Liverpool refitting turbines at Burbo Bank offshore wind farm, at the entrance to the River Mersey.